Have you ever tried to clean the glass on your shower doors and noticed white spots that won't come off? These are hard water stains and require chemicals and abrasive pads to remove. This is why it is best to leave the job of hard water stain removal in Houston Tx, to a proffessional. Above, you can see the before image on the left and the after image on the right of hard water stain removal. These white stains had covered the entire window before cleaning, but afterwards there isn't a stain in sight. The way we remove the stains at SMC Cleaning Services is with steel wool pads and a electric buffer. The buffer is similar to what is used to polish your car. The reason we use steel wool is because it is abrasive enough to remove the stains, but not so much as to scratch the glass. We start cleaning the window by applying a environmentally friendly chemical to your window. We then use our buffer with the steel wool pad to clean the window. This is a very labor intensive process that can take several attempts to remove the stain. 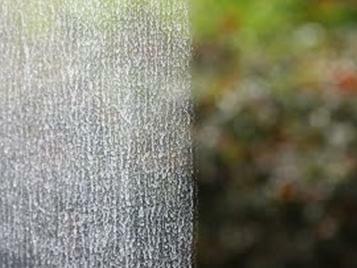 On average, hard water stain removal in Houston Tx takes about 30 minutes per window. This takes much longer than a traditional window clean that can be accomplished in less than a minute with some skill. This is why the price of cleaning a hard water stained window is higher than a regular cleaning. What are hard water stains? Hard water stains are caused by minerals, such as calcium, that are in your water. These minerals build up to the white spots over a period of time. This tends to be a major problem at houses who run off of well water. Well water has a notoriously high amount of minerals in it that stains the glass. Some ways to prevent hard water stains from returning are to make sure your lawn sprinklers are not spraying water on your windows. This is a common reason for hard water stains here in Houston, Tx. You should have a sprinkler installer move your sprinklers so they don't hit your windows. Another way windows get hard water stains is the tail from your pool cleaner whips out of the water and sprays the windows. The way to fix this problem is to have a pool maintenance proffessional adjust your pool cleaner. Why do hard water stains appear on shower doors? The same reasons as above. Your water has minerals in it and over time it leaves a residue on the windows. The cheapest and moved effective ways to prevent these spots is to squeegee the glass after every shower. You can purchase a shower squeegee at any home improvement store. Call SMC Cleaning Services today for Hard Water Stain Removal in Houston Tx. 281-899-0402. You can also fill out our contact form below for a free quote.